(+)-MK 801 Maleate is a potent, selective and non-competitive NMDA receptor antagonist with Kd of 37.2 nM in rat brain membranes. IC50 & Target: Ki: 37.2 nM (NMDA receptor, in rat brain membrane) In Vitro: [3H]MK-801 binds with NMDA receptor with a Kd of 37.2 ±2.7 nM in rat cerebral cortical membranes. MK-801 shows an inhibitory activity against N-methyl-D-aspartate-induced [3H]norepinephrine (NE) release and [3H]TCP binding in the hippocampus with IC50s of 20 nM and 9 nM, respectively. MK-801 progressively suppresses of current induced by NMDA. Mg2+ (10 mM) prevents MK-801 from blocking the N-Me-D-Asp-induced current, even when MK-801 is applied for a long time in the presence of NMDA. MK-801 blocks NMDA-activated single-channel activity in outside-out patches. MK-801 (< 500 μM) inhibits activation of microglia induced by LPS with increased Cox-2 protein expression in BV-2 cells. MK-801 (< 500 μM) reduces microglial TNF-α output with an EC50 of 400 μM in BV-2 cells. In Vivo: MK-801 (1 mg/kg) treatment before each METH injection reduces the extent of DA depletion by 55% in striatal of mice. MK-801 (1 mg/kg) also attenuates the effects of METH on microglial activation in striatal of mice. MK-801 (0.05, 0.2 mg/kg, i.p.) attenuates subsequent cocaine-primed reinstatement without disruption in rats. MK-801 (0.2 mg/kg, i.p.) prior to two reactivation sessions in the home cage shows no suppression on subsequent cocaine-primed reinstatement. Kinase Assay: Cerebral cortices from male Sprague-Dawley rats (200-300 g) are homogenized in 9 volumes of ice-cold 0.32mol/Lsucrose by nine strokes with a Teflon/glass homogenizer at 500 rpm. The homogenate is centrifuged for 10 min at 1×103 g, and the supernatant is recentrifuged at 1×104 g for 20 min at 4°C. The pellet is suspended in assay buffer (118 mM NaCl/4.7 mM KCl/1.2mM MgSO4/5 mM NaHCO3/20 mM Hepes/1.2 mM KH2PO4/2.5 mM CaCl2/11 mM glucose, pH 7.4) and incubated at 23°C for 20 min prior to final centrifugation at 1×103 g for 20 min at 4°C. The pellet is resuspended in assay buffer (70 mL per gram of original tissue). Binding of [3H]MK-801 is measured by incubating 750 μL duplicate aliquots of this crude membrane suspension (=0.75 mg of protein) with 100 μL of buffer containing displacer or of buffer alone (total binding), 100 μL of 50 nM [3H]MK-801, and 50 μL of buffer for 60 min at 23°C. 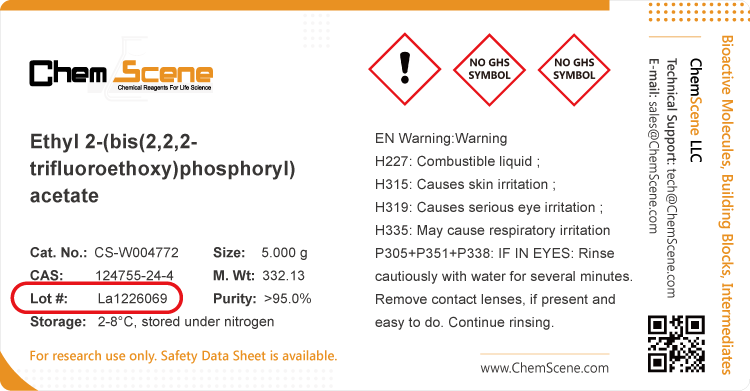 Nonspecific binding is defined by 100 μM (final concentration) unlabeled MK-801. Animal Administration: MK-801 is formulated in saline.Animals are given saline or MK-801 followed by cocaine 30 min later in the home cage instead of in the CPP apparatus for the two days of “reactivation.” This is done to determine whether reactivation of the memory for the cocaine-associated context by cocaine in the CPP context is necessary for the ability of MK-801 to disrupt reconsolidation. Animals undergo preconditioning, conditioning, testing, and extinction but animals are injected with saline or MK-801 (0.20 mg/kg, i.p.) 30 min prior to a cocaine injection (10 mg/kg, i.p.) in the home cage. Animals remain in the home cages, and the next day, the procedure from the first day of reactivation is repeated. The following day, animals are tested for cocaine-primed reinstatement in their CPP box without any prior microinjection of saline or MK-801. Huettner JE, et al. Block of N-methyl-D-aspartate-activated current by the anticonvulsant MK-801: selective binding to open channels. Proc Natl Acad Sci U S A. 1988 Feb;85(4):1307-11. Thomas DM, et al. MK-801 and dextromethorphan block microglial activation and protect against methamphetamine-induced neurotoxicity. Brain Res. 2005 Jul 19;1050(1-2):190-8. Snell LD, et al. Comparison of the effects of MK-801 and phencyclidine on catecholamine uptake and NMDA-induced norepinephrine release. Eur J Pharmacol. 1988 Jan 12;145(2):223-6. Jiang L, et al. Decrease of growth and differentiation factor 10 contributes to neuropathic pain through N-methyl-D-aspartate receptor activation. Neuroreport. 2017 May 24;28(8):444-450. Brown TE, et al. The NMDA antagonist MK-801 disrupts reconsolidation of a cocaine-associated memory for conditioned place preference but not for self-administration in rats. Learn Mem. 2008 Dec 2;15(12):857-65. Wong EH, et al. The anticonvulsant MK-801 is a potent N-methyl-D-aspartate antagonist. Proc Natl Acad Sci U S A. 1986 Sep;83(18):7104-8.